Food in a culinary mystery can play a role in the plot and also reflect the story's themes. David Sax writes in The Tastemakers, a book about food fads, that fondue is a conjurer of the past. And Final Fondue is all about the past. The Chesapeake Bay town where café manager Val Deniston lives with her widowed grandfather is celebrating the 300th anniversary of its founding. 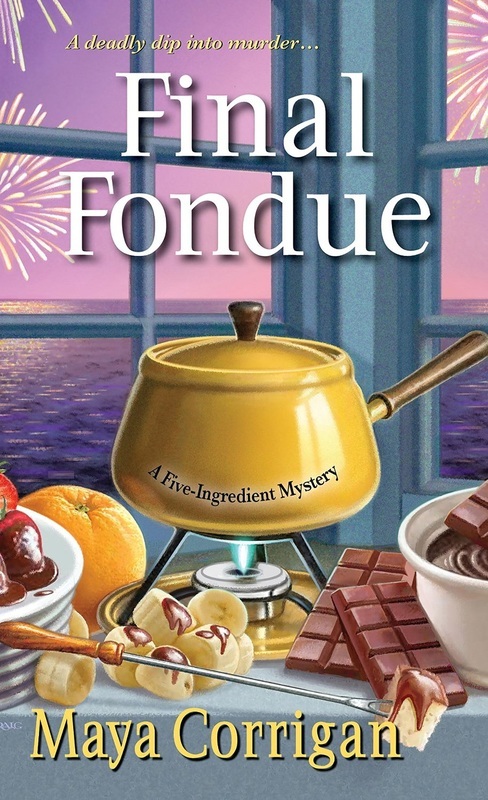 As Granddad readies his house for weekend visitors to the town’s Tricentennial festival, he finds an old fondue pot and whips up chocolate fondue to greet the houseguests. Besides conjuring the past, fondue, especially chocolate fondue, is associated with romantic love. It evokes images of chocolate fountains at wedding receptions and Valentine’s Day tête-à-têtes with heart-shaped strawberries for dipping. Granddad couldn’t have chosen a more appropriate dish for his houseguests, who’ve come to town not only to enjoy the festival but also to plan a wedding. As the would-be bride, best man, maid of honor, and a bridesmaid gather over chocolate fondue, Val notices dark currents of resentment under the surface. Barbs fly across the table between the bridesmaid and the maid of honor. Are they envious of each other’s relationship to the bride or are they both vying for the attention of the best man? Showing no interest in either of them, he appears smitten with the bride, his best friend’s fiancée. When one of the guests raids the fridge for leftovers and holds a solo fondue party in the backyard, a murderer joins the private party. Val comes to a chilling conclusion after stumbling over the guest's body in the dark: the victim could have been mistaken for someone else. And a killer who makes a mistake the first time might try again. To prevent that from happening, Val and Granddad team up to identify and trap the murder. But first they have to figure out who the intended victim was and plumb the dark side of love—possessiveness, jealousy, and vengeance.